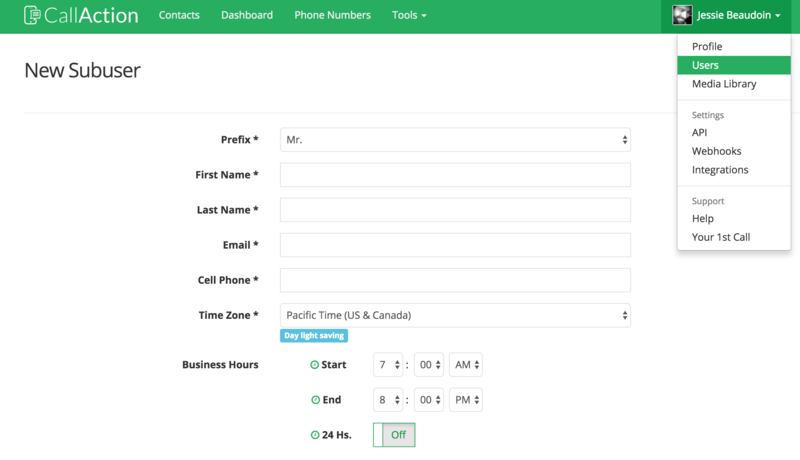 You can easily create sub user accounts on CallAction in less than 5 minutes. Your sub-users will have their own login to view their dashboard and settings but are limited to only seeing their own leads and activity. You may add an additional user(s) at any time and will automatically be billed according to your CallAction plan. You can add or remove users and reassign user accounts to others by simply updated the profile record with new contact info. If you are on a Team plan your new sub-user can be instantly added to our round-robin lead router and call broadcast tools. If you are on a Solo plan you can only add one additional user. If you need to upgrade your account from Solo to Team, please contact us via chat support. Please contact us with any questions or if you are planning on adding over 25 sub users to your Team plan using the chat support at the bottom right side. Next, you will need to add a CallAction phone number for the sub-user. If you already have an extra CallAction number ready, you will need to assign the number to your new sub user. Next, your user should start to personalize their text message settings and set up CRM and lead source integrations and familiarize themselves with the user interface. Explanations for the main user settings. Timezone: Select your correct time zone as this controls text message delivery times. Business Hours: These are the delivery hours for text message automation. Admin Access: Default is "No", turning "ON" gives the user full access to platform, views, and ability to add phone numbers. Any questions, please contact us via chat support at the bottom right. CallAction offers a free 14-day trial of our services. You can set up an account in less than 10 mins now and we'll contact you to set up a full demo of our marketing automation services.